Part number: 4E0035111A. Removed from: Audi A6 C6 Avant 2006. Item: 6 CD changer. AUDI A4 B8 A5 2008-2012. REMOVE FROM AUDI A6 C6 2.0 TDI ,2008 YEAR,140 BHP ESTATE,AUTOMATIC KTD GEARBOX,ENGINE CODE BRE,PAINT CODE LZ7Q GREY. MY AIM IS TO MAKE SURE YOU ARE ALWAYS 100% HAPPY! PANASONIC CX-DP600EN Car 6 disc Cd Changer. The unit has usual scuffs from being in a boot or under a seat most of its life but nothing serious. CD changer, tested and in full working order and very good cosmetic condition, please see photos. removed from a 2007 3.2fdi S line cabriolet. Postage quoted for mainland UK only excluding Scottish Highlands please email me for quotes outside this area. Panasonic DP801 8 disc CD changer. In good condition. AUDI A6 S6 C6 4F A8 S8 D3 2004-2010 MP3 6 DISK CD CHANGER 4E0035110A 4E0910110C. Condition is Used. Dispatched with Other Courier 5 days. This is NOT Plug & Play item. Nearly all electrical components requires professional reprogramming. We DON'T have car VIN numbers, because we don't brake cars. GENUINE AUDI A6 S6 C6 4F AUDI A8 S8 D3 2004-2010. MP3 6 DISC DISK CD CHANGER UNIT. YOUR VEHICLE BY MATCHING PART NUMBERS ON YOUR ITEM WITH. PART NUMBERS: 4E0 035 110 A / 4E0 910 110 C. ITEM IS USED BUT IN FULL WORKING ORDER. CA-CC30N Conversion cable for DVD / CD Changer The cable adapter is designed to connect to Panasonic DVD / CD Changer (DIN connector type, CX-DH801U, CX-DP880) to System-up connector. 1 X PANASONIC CA-CC30N DVD/CD CHANGER CABLE. Will fit heads with the 8 pin connector. Black coloredAUDI A6 Avant SE 2.0 tdi(2007). We try our best to make sure that you receive the item as you have expected it to be. In such a case. This item would be supplied as pictured. What you see is what you get. PANASONIC CD MULTICHANGER AS FITTED IN BOOT. SUITABLE FOR OTHER SEAT, AUDI, VW MODELS. FROM 2000 SEAT IBIZA. We will be happy to resolve any issues and we hope you appreciate we are human and mistakes can be made. Original Box (box is bit tatty). I will reply it as soon as possible. Must see All pictures. THIS IS FOR A USED PANASONIC DP60 6 DISC CD CAR CHANGER THAT IS IN GOOD CONDITION. NO CABLES OR MOUNTING BRACKETS INCLUDED, SO IT IS UNTESTED DUE TO LACK OF PARTS. WEIGHT IS APX. Mazda BT 50. - FM/MW/AM/LW Radio Tuner - RDS EON. Ford Ranger / Thunder. In this instance we would suggest that you consult your Ford or Mazda Main Dealer for further advice regarding compatability. Refurbished Radio / CD. Taken from a 2005 Octavia. SKODA CD MULTI CHANGER. A used but in good condition with minimal use 6 disc changer 1Z0 035 111A. 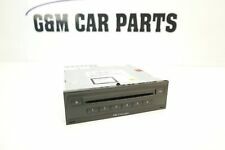 1999-2004 VW GOLF BORA PASSAT 6 CD DASH SINGLE CDPlayer. Genuine Vw item made by Panasonic. The cd player is in good working order with no code needed (just plug & play). AUDI A4 8K A5 8T. GENUINE CD CHANGER. IF THERE IS A PART YOU ARE LOOKING FOR AND YOU CAN NOT FIND IT. WE HAVE FOR SALE A PANASONIC 6 DISC CHANGER UNIT AS FITTED O.E. TO AUDI / VW / SEAT / SKODA MODELS CIRCA 2003 T0 2008. This item has been removed from greySkoda Octavia Elegance 1.9 TDi(2005). We try our best to make sure that you receive the item as you have expected it to be. In such a case. This item would be supplied as pictured. I have a used CD magazine f or sale for a CD changer manufactured by Panasonic and Matsushita. Item is in used condition may have usage marks and scratches. has got a hair line crack underneath face. Shown in Pictures. We have a wide range of vehicles and parts on site. We are based in Northern Ireland in Co Armagh. Established in 2013. NOT HAPPY?. - let us know so we can fix it. We love to hear that you are satisfied with our service and parts. FOR 12 DISC MULTICHANGER. PANASONIC 12-DISC MAGAZINE CA-MP1200D. CD CHANGER. Make: 2012 AUDI A6 PREMIUM PUS. We will do our best to fix any problems. SKODA OCTAVIA MK2 2008. IN BOOT CD CHANGER. All parts are stamped & removal of the marks will invalidate your warranty. In the event that a part is supplied and proven to be incorrect or faulty, KENT AUTOPARTS must be notified within 48 hours. This item has been removed from a blackAUDI A3 Sport 1.6 Petrol (2003). We try our best to make sure that you receive the item as you have expected it to be. In such a case. This item would be supplied as pictured. 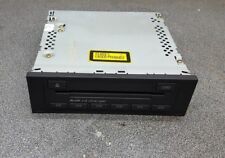 AUDI A1 8X Q3 8U Q5 8R A5 PANASONIC CD CHANGER 8X0035110. REMOVED FROM A SKODA OCTAVIA MK2 2006. CD CHANGER. All parts are stamped & removal of the marks will invalidate your warranty. In the event that a part is supplied and proven to be incorrect or faulty, KENT AUTOPARTS must be notified within 48 hours. SKODA OCTAVIA MK2 2007. IN BOOT CD CHANGER. All parts are stamped & removal of the marks will invalidate your warranty. In the event that a part is supplied and proven to be incorrect or faulty, KENT AUTOPARTS must be notified within 48 hours. 6 DISC CD CHANGER. OUR REF: X5167.